Chemical Structure of 1,3-bis[2-(4-tert-butylphenyl)-1,3,4-oxadiazo-5-yl]benzene (OXD-7); CAS No. 138372-67-5; Chemical Formula C30H30N4O2. 1,3-bis[2-(4-tert-butylphenyl)-1,3,4-oxadiazo-5-yl]benzene (OXD-7) is a well known electron-transporting material due to the electron-accepting property of the oxadiazole units. Together with poly(9-vinylcarbazole) (PVK, electron donating), OXD-7 (electron withdrawing) is the most widely used hybrid-type host due to its good solubility and film morphology by the bulky tert-butyl units. OXD-7 has also been used as an ultraviolet emitter, with MoO3 as hole injection and buffer material showing relatively high external quantum efficiency . 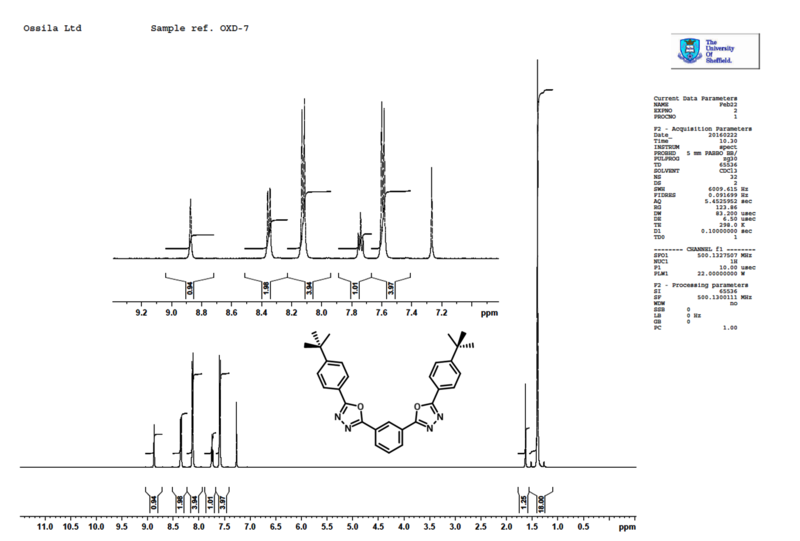 11H NMR of 1,3-bis[2-(4-tert-butylphenyl)-1,3,4-oxadiazo-5-yl]benzene (OXD-7) in CDCl3. Highly efficient ultraviolet organic light-emitting diodes and interface study using impedance spectroscopy, Q. Zhang et al., Electron Optics, 126 (18), 1595-1597 (2015). Small Molecule Host Materials for Solution Processed Phosphorescent Organic Light-Emitting Diodes, K. Yook et al., Adv. Mater., 26, 4218–4233 (2014). High power efficiency solution-processed double-layer blue phosphorescent organic light-emitting diode by controlling charge transport at the emissive layer and heterojunction, K. Yeoh et al., Phys. Status Solidi RRL 7, No. 6, 421–424 (2013) / DOI 10.1002/pssr.201307089. Highly efficient solution processed blue organic electrophosphorescence with 14lm∕W luminous efficacy, M. K. Mathai et al., Appl. Phys. Lett. 88, 243512 (2006); http://dx.doi.org/10.1063/1.2212060. Efficient solution-processed small-molecule single emitting layer electrophosphorescent white light-emitting diodes, L. Hou et al., Org. Electronics, 11 (8), 1344-1350 (2010), doi:10.1016/j.orgel.2010.05.015. High efficiency, solution-processed, red phosphorescent organic light-emitting diodes from a polymer doped with iridium complexes, M. Song et al., Org. Electronics, 10 (7), 1412–1415 (2009), doi:10.1016/j.orgel.2009.07.012. Single emissive layer white phosphorescent organic light-emitting diodes based on solution-processed iridium complexes, W. Cho et al., Dyes and Pigments, 108, 115-120 (2014), doi:10.1016/j.dyepig.2014.04.033. Efficient organic light-emitting devices with platinum-complex emissive layer, X. Yang et al., Appl. Phys. Lett., 98, 033302 (2011); doi: 10.1063/1.3541447. Cyclometalated Ir(III) Complexes for High-Efficiency SolutionProcessable Blue PhOLEDs, V. Kozhevnikov et al., Chem. Mater., 25, 2352−2358 (2013); dx.doi.org/10.1021/cm4010773. Efficient phosphorescent polymer light-emitting devices using a conjugated starburst macromolecule as a cathode interlayer, X. Zhang et al., RSC Adv., 6, 10326 (2016); DOI: 10.1039/c5ra19156d. Water-Soluble Lacunary Polyoxometalates with Excellent Electron Mobilities and Hole Blocking Capabilities for High Efﬁciency Fluorescent and Phosphorescent Organic Light Emitting Diodes, M. Tountas et al., Adv. Funct. Mater. 2016; DOI: 10.1002/adfm.201504832. New sulfone-based electron-transport materials with high triplet energy for highly efficient blue phosphorescent organic light-emitting diodes, S. Jeon et al., J. Mater. Chem. C, 2, 10129-10137 (2014); DOI: 10.1039/C4TC01474J.